Veronica Carpio stood at the center of her Boulder County hemp field, surrounded by mature plants that proved their resilience this summer by growing taller and bushier in response to a nasty hail storm. 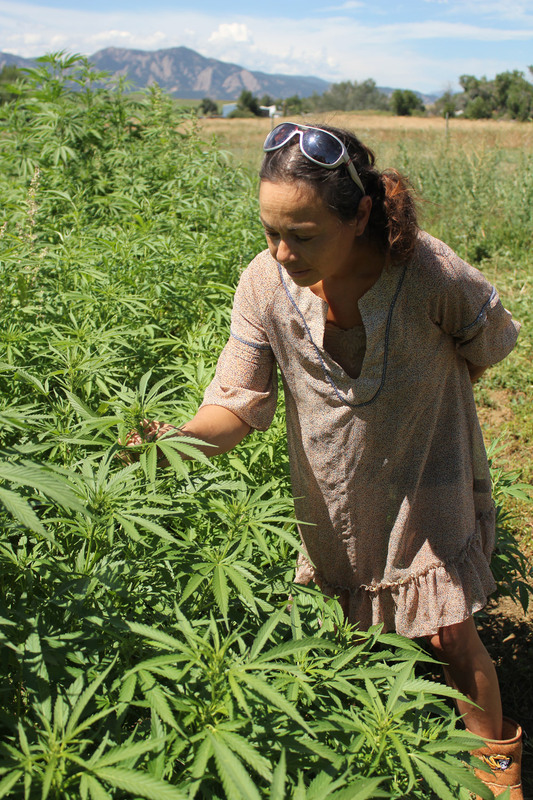 In coming weeks, Carpio, who owns Colorado Hemp Coffee, plans to host periodic tours of her flowering outdoor hemp field. Hemp enthusiasts can find out about the tours via Carpio’s Facebook page and business websites (coloradohempcoffee.com or Facebook.com/HempCoffee). “I want to know what’s going to happen with the bees,” said Carpio, her forearms caked with botanical dust. Should that pollen come into contact with female marijuana plants, Carpio said, those plants would produce many seeds among the THC-rich buds. The hemp pollen solution for indoor marijuana grows? A high-quality HEPA filter to keep out the hemp pollen. Anyone growing marijuana outdoors, and most especially near pollinating hemp, may be in for a disappointment, according to Carpio. When Colorado voters approved Amendment 64 to legalize marijuana in 2012, they also helped inch open the door to an industrial hemp revival. Now entrepreneurs such as Carpio are experimenting with cultivating and processing the plant, which has myriad applications but has been especially popular lately for potentially possessing cannabis health benefits minus the marijuana high. The handful of hemp growers and enthusiasts gathered for this particular tour often fell into excited chitchat about seeds, strains, cultivars, chemical compounds and hemp industry trailblazers. Grant Orvis, a Longmont molecular geneticist, attended Carpio’s tour because of his interest in developing hemp that’s especially well-suited to growing in Colorado’s high and dry climate. “I want to see how many cultivars Veronica has here,” Orvis said. Bill Hawkins, an herbalist and organic farmer, drove from Nebraska for the tour. He hopes that hemp will provide an avenue for economic revitalization in his state. “It’s the excitement over these first plantings, and the reawakening of this industry” Hawkins said of his motivation to visit Carpio’s hemp field. This harvest is earmarked for Colorado Hemp Coffee’s research-and-development initiatives. Carpio intends to use the crop to build a hempcrete shed alongside the field, and already started producing cannabidiol (CBD) caplets, which she says are quickly gaining favor among consumers.